Abstract. 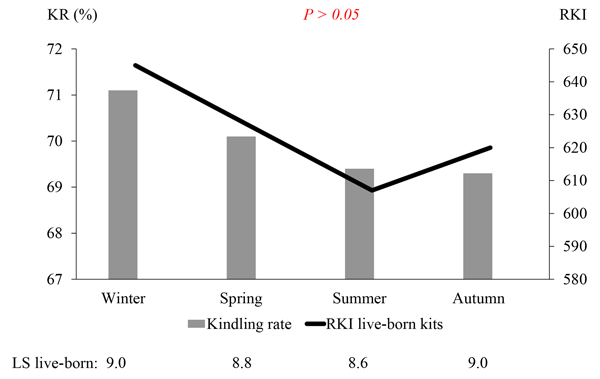 The kit index (KI) combines the kindling rate (KR) and the average litter size (LS) per group of does, per breeding round, per year, or per farm and represents the number of total or live-born kits per 100 inseminated does. 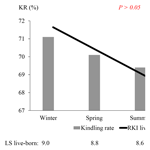 The KR is the percentage of kindlings per number of inseminated does. Mathematically, the KI is the product of the KR multiplied by the average LS. The KI was calculated on the basis of 12730 inseminated does and 89 864 live-born kits from one rabbit farm during a 25-month period from 2015 to 2017. The average KR was 70.1±9.1% with a minimum (per breeding round) of 35.4% and a maximum of 90.8%. The average LS of total kits born was 9.16±0.91, whilst the average litter size of live-born kits was 8.87±0.90. The KI of total kits born was calculated to be 649± 121 kits per 100 inseminated does (min of 332, max of 971), while the KI of live-born kits ranged between 326 and 944 kits per 100 inseminated does (mean of 626±122). The KI is a normally distributed parameter with respect to both the total kits born and the live-born kits per 100 inseminated does. All three parameters (KR, LS, and KI) were characterized by large variations from week to week with a tendency toward a reduction in the summer months. No difference was found between the two housing units, but large differences were found between the two genetic strains used on the given farm. Therefore, it can be concluded that the KI is able to characterize the complex fertility situation on the given rabbit farm. The KI can be used to demonstrate and to solve problems regarding artificial insemination, in addition to general issues with insemination management. How to cite: Hoy, S.: A new parameter describing fertility in rabbits at the farm level: the kit index, Arch. Anim. Breed., 61, 463-467, https://doi.org/10.5194/aab-61-463-2018, 2018. The rabbit kit index (KI) combines the kindling rate (KR) and the average litter size (LS) per group of rabbit does per year or per farm and represents the number of total or live-born kits per 100 inseminated does. The KR is the percentage of does kindling from the total number of inseminated does. The KI characterizes the complex fertility situation on a given rabbit farm. The KI can be used to demonstrate and solve problems with artificial insemination and general insemination management.